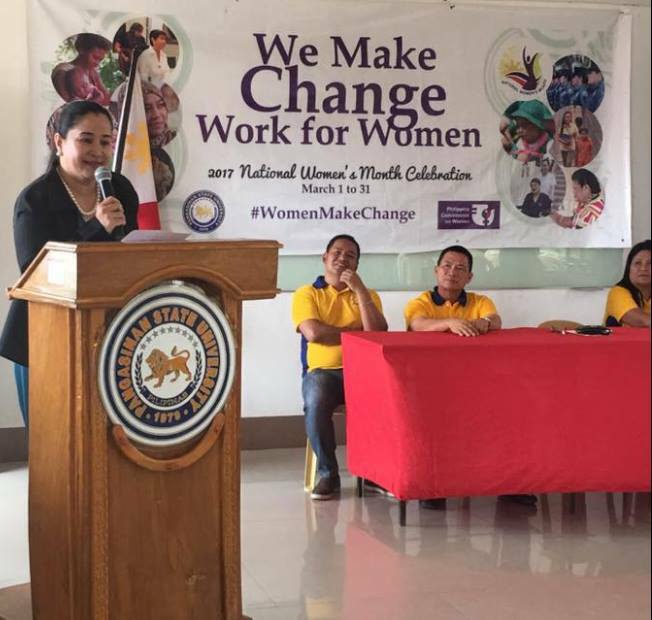 In the observance of the National Women’s Month, the PSU Binmaley Campus holds a one-day seminar for women on March 22, 2017 at the Campus Social Hall. This year’s celebration focused on the theme, “We Make Change Work For Women”. Four distinguished women from different fields served as the Resource Speakers of the said event. Atty. Geraldine U. Baniqued, Legal Provincial Officer of the Province of Pangasinan, talked on the Magna Carta of Women while Mrs. Grace M. Festiken, Gender and Development (GAD) Coordinator of Labrador District, shared an Inspiring Story of Women for Positive Change. The other two speakers are Mrs. Jesusa M. Sanchez, Coordinator of Student Services, Alumni Affairs, Admission, Guidance and Testing and Mrs. Mylene R. Abalos, faculty member, both from the PSU Binmaley Campus. Mrs. Sanchez inspired the students with her success story being a cancer survivor while Mrs. Abalos shared her views on Women Empowerment through Personality Development. Dr. Marcelo C. Gutierrez, Jr., Campus Executive Director gave his welcome remarks to the participants of the seminar. He was impressed by the concerted efforts of the faculty and staff in the realization and success of the celebration. Special mention was addressed to Mrs. Gina S. Millamina and Jean Camille C. Ermino, GAD Coordinators for spearheading the seminar. Dr. Rosario B. Miguel, College Dean of the Teacher Education and Mr. Jonathan R. Jose, Administrative Officer, also graced the occasion.